I haven’t mentioned much about the ongoing decline of newspapers in a while, but the situation continues to decline steadily. (Maybe I’ve just been remiss because the subject depresses me.) Indeed, there was a lot of happy talk going into 2011, suggesting that revenue growth would resume and and the newspapers would stabilize. It doesn’t seem to have happened. 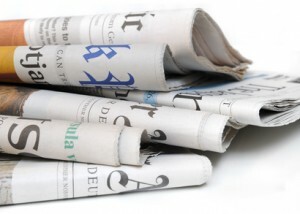 Newspaper jobs are disappearing faster than ever. Erica Smith’s Paper Cuts blog reports that newspapers cut more than 3,775 jobs in 2011, and the American Society of Newspaper Editors tells us that nearly one-third of newsroom jobs have been eliminated since 1989. Advertising sales aren’t coming back as hoped. Digital advertising was up 8.3%, according to an analysis by Alan Mutter, but those revenues make up only 14.3% of the total. Mutter predicts that when all the numbers are in, we’ll find that the numbers didn’t top $24 million, which would make 2011 the worst year since 1985. Most print newspapers will be gone in five years. That’s what USC’s Annenberg School tells us in a new report: “Is American at a Digital Turning Point?” The Annenberg Center predicts that the only surviving print newspapers will be the very biggest (specifically, The New York Times, the Wall Street Journal, USA Today and the Washington Post), and possibly some local weeklies. This has enormous indications for the many companies that continue to rely on local newspapers to reach buyers. If you’re in a business that relies on local buyers, what’s your game plan for adapting to this?